I feel I haven't in some time. You guys know my love of fashion but truthfully, shooting OOTD's gets difficult around here during the winter time. But I took some time out of our long weekend to shoot a couple of pieces I've been obsessing over lately. 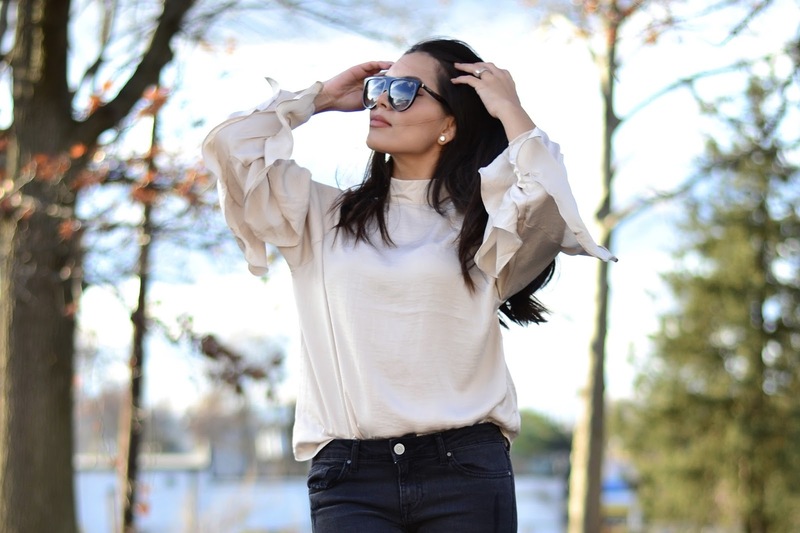 This time around it was this $9.99 ruffle blouse from H&M, I am sorry but I don't see it online, I got it at the store. From the moment I saw it on the mannequin, I knew I had to have it. And I was right. I love the fit, the feel and the color. It's perfect with denim, with leather and lace. On a side and much more important note, today is Giving Tuesday and I wanted to share some links with you guys that I think you will love. I am all about giving back and paying it forward... I am very blessed and if there is anything that fills me most, it is the joy in giving. My favorite charity, which I hold dear and near to my heart is St. Jude Children's Research Hospital. I would love it if you found a moment tonight and made a donation in honor of Giving Tuesday. I was recently introduced to L.O.V.E. Mentoring, a mentoring program for young Latinas which works with Latinas in NYC. Did you know that teens in the Latino community attempt suicide at twice the rate of non-Hispanics? That's 26%. We also have the highest teen pregnancy rates of any racial or ethnic groups. L.O.V.E supports and encourages Latinas to be the best they can be, not just in school but in life. I love the message behind this inspiring organization, please check it out. Lastly, if you are looking to volunteer in New Jersey, Hoboken Girl has shared 15 organizations that are looking for your help. From shelters to the red cross and the boys and girls club, if you are looking to donate some time and change someones life not just during the holidays but forever... I suggest you check out THIS link for more info. It feels so good to give back and to use my platform to spread love and light. Remember, when times are bad, pray and when times are great, PRAY.